As solar power becomes more prevalent, the power grid needs support in regulating reactive power. Sparq's solution offers dynamic reactive power that can be centrally controlled. Power grids that enjoy a comparatively high level of distributed power generation assets are struggling to address the potential threats to power quality and grid stability that independent distributed power production can bring. Chief among those challenges are (1) nearly harmonic free continuous current injection onto the grid, (2) dynamic voltage support, (3) grid frequency stabilization, and (4) Fault-Ride-Through (FRT) capability. Up to now, the solutions available to the power utility grid provider have been to limit the further deployment of distributed solar electric systems, or to strictly permit only traditional, less-productive string-based centralized inverters on PV arrays. Advanced non-linear control techniques ensure that harmonics to the contributed AC current are virtually eliminated. Sparq’s technology is ‘smart grid’ ready. The patented power architecture with exceptionally fast dynamic response allows full control of active and leading/lagging reactive power, voltage and frequency stabilization, and ride-through capability during a system fault. Installing Sparq’s Quad on the grid’s edge helps to counteract the influence that other loads may be having in destabilizing the grid. Many such destabilizing loads can have effect on grid stability, so it is crucial that any localized insertion of both real and reactive power be remotely and dynamically controllable. The Quad’s secured communication channels permit ancillary use of the microinverters by the electrical utility companies to dynamically adjust the insertion of reactive power from each Quad microinverter individually, from up to rated VAR-leading through rated VAR-lagging per microinverter, and all points in-between. The architecture and fundamentals underlying Sparq’s power conversion solutions can be found in the more than 60 granted and pending patents filed by the founder and the researchers who make up the core of Sparq’s engineering team. Sparq has an extensive IP portfolio that includes patent filings and provides coverage for features including instantaneous maximum power point tracking, topology using two-conversion stages, transformer isolation, efficient resonant power processing, very-high switching frequencies, elegant control techniques, very high power-densities, grid harmonic reduction and reactive power control. The basic power conversion architecture used by Sparq’s solutions is shown in the diagram below. One digital loop tracks the maximum power point without any trial and error and always provides correct direction toward the best operating point. This offers a robust and accurate reference point and results in a significant reduction in the input capacitor. A second digital loop implements a new pulse width modulation technique that reduces the size of the inverter, provides high efficiency over a wide range of solar irradiation, and keeps the output current harmonics at a low level. A third digital loop provides fast and stable operation of the system under all operating conditions. Key to the effectiveness of Sparq’s platform is the high-frequency digital control system. It enables frequent DC input power and grid reference waveform sampling, which allows for very rapid response to the voltage and current oscillations that PV modules typically display. The architecture’s faster response to power oscillations from the PV modules ensures that more of the power generated by the PV modules is captured and placed onto the grid in a highly-stable and highly-consistent manner. This technique is superior in both performance and long-term reliability to the more traditional approach to energy harvest, which is to use large (typically electrolytic) capacitors to store and release energy to the DC/DC conversion process (known as “burst mode”). One of the distinct benefits of Sparq’s technique is to facilitate continuous AC current insertion on the grid as opposed to a pulsing circuit insertion that may otherwise be caused by burst-mode power harvesting. The output from the first conversion stage of the microinverter consists of a high-frequency AC component and a DC component, isolated from the DC energy inputs from the PV module. 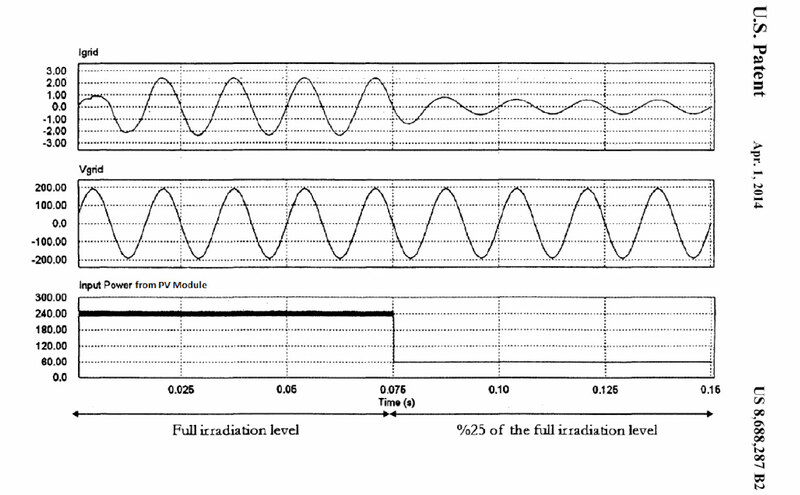 In addition to conveying more of the PV module’s energy, the dual-component approach uses a high-frequency AC signal that carries voltage variations using amplitude modulation over a frequency that closely approximates that of the AC grid. 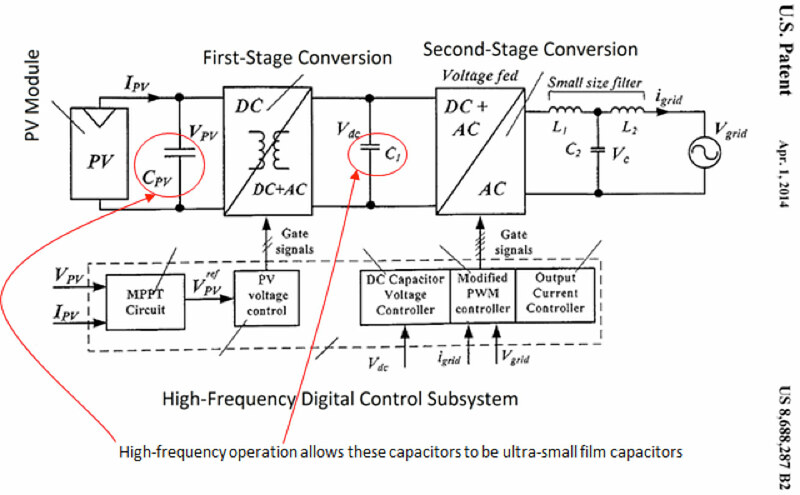 This approach allows more energy transfer through the conversion process while reducing the stress that can be caused in more traditional approaches by high DC bus voltages. The second power conversion stage of the microinverter combines three sophisticated control mechanisms to complete the conversion process. First among them is the use of a modified pulse-width modulation technique that removes frequency harmonics from the resulting converted AC current waveform. The second mechanism (not shown in detail above) is the application of an enhanced phase-locked loop (EPLL) to adjust the degree of lead or lag of the AC current waveform relative to the reference phase of the AC grid voltage. This second mechanism is instrumental in not only maintaining a high power-factor in typical operation; it also creates the potential for adjusting the degree of lead or lag of the current waveform, thereby generating adjustable reactive power and placing on the AC grid, if desired. The third mechanism is an actively-controlled output filter that conditions the injected AC current, removing any remaining harmonics and delivering a smooth sinusoidal current signal to the grid. The graphs show how the AC voltage and current waveforms produced by the Sparq microinverter adjust gracefully to a step-function change in PV module power output from 100% of its maximum to 25% of its maximum: the AC voltage waveform is unperturbed, and the injected AC current gradually dampens with minimal distortion and with no loss of synchronization or phase alignment with the grid voltage. This Technical Note provides a very high-level overview of the important innovations in power conversion that the Sparq Systems microinverter platform offers. In addition to contributing to grid stability as shown above, Sparq’s novel approach has significantly reduced the power circuit complexity by using complex mathematics, which is digitally implemented. reducing the complexity of the power circuit has removed many of the physical constraints suffered by more traditional power conversion approaches, resulting in a light-weight, compact-size, cost-effective and feature-rich microinverter design that provides superior power density and unparalleled high reliability. Our base resonant technology has its roots in space and telecommunications applications where power supplies have been in continuous operation for over 20 years under harsh environmental conditions. A core part of the Quad’s development program has been to subject the microinverter to Highly Accelerated Life Tests (HALT) performed by an independent laboratory, producing results that demonstrate high vibration resistance and exceptionally broad thermal margins. Because the architecture is built using high-frequency digital control, system parameters can be modified to generate predictable and consistent results. The use of a ZigBee interface enables the system to take remote commands via a gateway to change key parameters, thereby offering the utility grid provider the flexibility to inject a specific amount of reactive power at the grid’s edge for a determined period of time, if circumstances require it. As seen by emerging requirements such as Rule 21 in California, the growing incidence of distributed solar power generation will drive demands by utility grid providers to be able to dynamically control both real and reactive power output at the grid’s edge. Unlike any other single-phase inverter on the market today, Sparq has implemented in its Quad microinverters an architecture that is prepared to interoperate fully with emerging grid stability and remote power control requirements. And it does so while also providing superior total power harvest, component lifetime, and value. “Power Converter for a Power Generator”, US Patent Number 8,467,200, June 18, 2013. “Distributed Power Generation Interface”, US Patent Number 8,688,287. Zhao, Wu, Lai, Yu, “Utility Grid Impact with High Penetration PV Micro-Inverters Operating under Burst Mode Using Simplified Simulation Model”, IEEE Energy Conversion Congress and Exposition, Phoenix, AZ, USA, September 2011. Find out what solutions are right for you. See the performance of your system on our SparqVu energy management system.